Add fresh yeast to a bowl and dissolve in lukewarm water. Add flour, semolina, salt, and half of the olive oil. Knead until a smooth dough forms. Cover with a kitchen towel and let rise for approx. 1 hr., or until the dough has doubled in volume. In the meantime, cut bell pepper, eggplant, and zucchini in to small pieces. Fry vegetables in a hot grill pan on both sides until browned, brushing with olive oil from time to time. Remove vegetables from the grill pan, chop, and add to a bowl. Finely chop basil leaves and add to the bowl, along with lemon zest, grated Parmesan cheese, salt, and pepper. Stir to combine. Preheat oven to 220°C/430°F. Halve the dough and dust with semolina. Roll one half out into a large circle approx. 25 cm/10 in. in diameter. Slice mozzarella cheese and place a quarter on one side of the dough. Top with grilled vegetable mixture and another quarter of the mozzarella cheese. Fold the dough over the filling and seal the edge. Repeat with second half of the dough and the remaining cheese. Transfer calzone to a baking sheet and brush with olive oil. Bake at 220°C/430°F for approx. 10 min. In the meantime, add tomato purée, dried oregano, salt, pepper, and remaining olive oil to a bowl, and stir to combine. 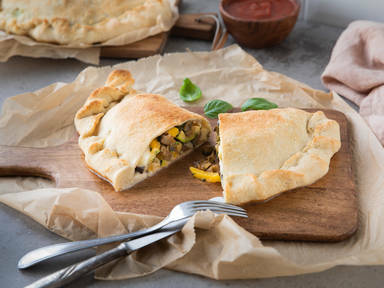 Serve calzone with tomato sauce. Enjoy!